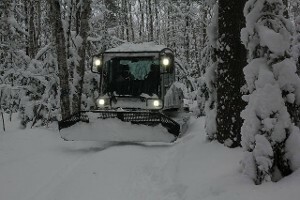 Having the most heavily traveled trail system in Michigan historically we did a lot of our grooming at night. Today, though you are likely to see us out there anytime and the lights on the grooming equipment are not as bright in the day time. So stay alert and give us a wave as you pass. 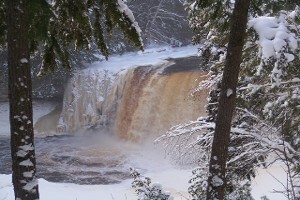 The Paradise Area Night Riders groom 120 plus miles of the Upper Peninsula's most spectacular snowmobile trails. If you love to ride, make plans to experience our trails. You will not be disappointed. 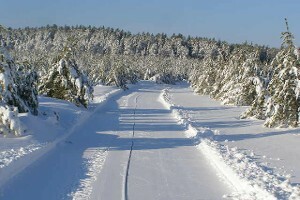 The icons to the left are links trail maps, road conditions, and weather predictions to better plan your trip to Paradise. Our groomers are riders too. They enjoy the trails and provide you with top trail reports. Check back often! They will tell it to you straight as they want you to return and enjoy yourself, again and again. Thanks to Ben for such funtastic images!